Mary Paglialunga, second from right, poses with other runners from the Run 169 Towns Society, a group dedicated to running a road race in each one of Connecticut’s 169 towns. FAIRFIELD -- It was the T-shirts that first caught Mary Paglialunga’s eye. The shirt was blue, with a yellow outline of the state of Connecticut in the middle with some runners making their way along a winding road. 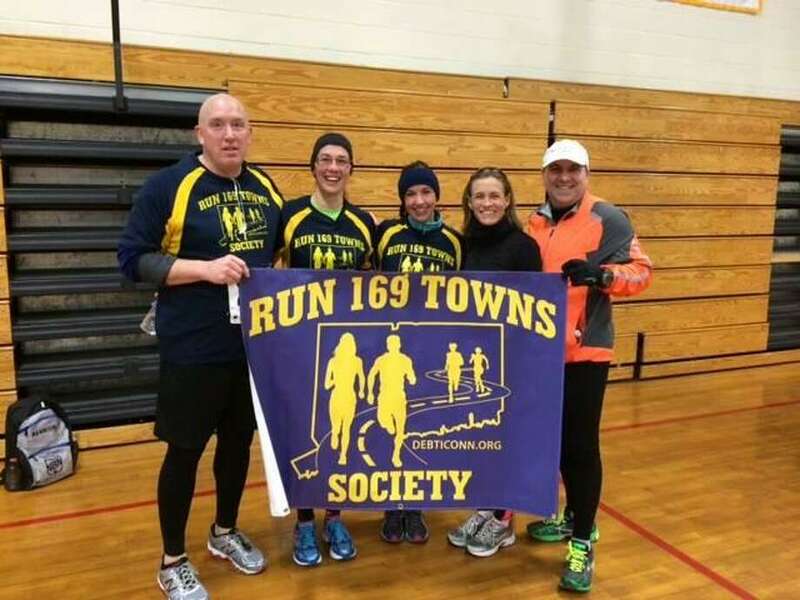 The words on the shirt read: Run 169 Towns Society. It was March of 2012 when the first meeting of www.debitconn.org - Do Every Blessed Town in Connecticut - took place. Since its formation some six years ago, thousands of runners have joined the club, looking to run a road race in every one of the state’s 169 towns and villages. It was one of those original founders, Adam Osmond, that was wearing the shirt that day in Trumbull. As of July 6, 2018, there are 2,843 members of debitconn, with more joining the club just about every day. “The way it started was, eight of us got together and decided to organize a (running) club and set up basic rules,” Osmond said. “So, we sat down and figured out what would count as an ‘official’ race. It had to be at least one mile, it had to be timed, and if a race went through more than one town, the town where the race started would count as the start point. There are currently 21 ‘kings’ - men who have completed all 169 races and 14 ‘queens’ who have done the same. But as it turns out, runners like goals. “Runners like to have something to accomplish, to look forward to,” Osmond said. “I’ve lived in Connecticut for over 30 years and I didn’t know that some of these towns existed. Now, not only do I know but I’ve run in most of them. Before this, a lot of runners would just run in their local area. Right now, Paglialunga, 53, has 165 races notched on her belt. No. 162 took place last November with a race in Hampton. Next came No. 163 Griswold in February, followed by No. 164 in April in Salem and No. 165 in New Hartford. Still to come are Marlboro, Willington, Durham and last but not least, No. 169 in West Haven. “I remember meeting Mary in Trumbull and she was so excited about it and now, here she is, she only has a few more races to go,” said Osmond. Not bad for someone that only started this adventure in January of 2014. Most of the road races throughout Connecticut of the 5K variety, although there are some 10K events, according to Paglialunga. What she truly enjoys about running these races are seeing the people that run. “There are families, husbands and wives, it absolutely boggles my mind,” she said. “You see everyone wearing the shirts. It’s free to join, you just enter your race and you’re off. It’s great, you’re running but you’re also out exploring Connecticut. The running has not come without its price, however. In November of 2015, Paglialunga had knee surgery, not too long before a race in Morris. “Morris is considered an ‘elusive’ town,” Paglialunga said. “They only have one race a year and it’s in January. I did the four-mile race on crutches. I didn’t want to wait around for a year to do the race, so in a driving rain and freezing cold, I ran it. It took me forever, but I did it. It was brutal. While Morris might have been the most challenging, there are others that standout for different reasons. Another was the overnight race in Montville. According to the debitconn website, there are 26 runners from Fairfield that are members of the 169 Towns group, including Chris Ahlberg (136 races), Kevin Ross (89), Monica Roche (79) and Vae Champagne (43). Paglialunga’s Fairfield race was the Colony Grill Hot Oil race back in 2013 before she joined the 169 group. And when she finally gets to 169? What next?